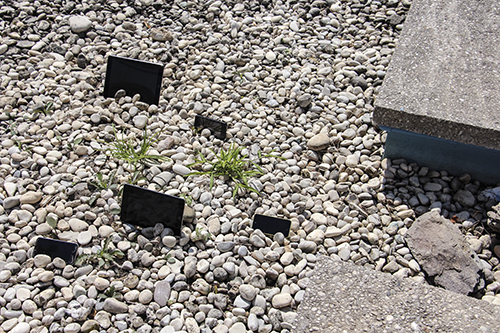 The “Incidents of iMirror-iTravel at the Venice Biennale, an #iDisplacements project, has nine instalments and plays out across a hybrid of physical and virtual sites, from the gravel paths of the Giardini della Biennale to the ever-shifting networks of social media, from textually interwoven myths and metaphors to the black-and-white graphic portal you see displayed on the wall in Raw Labs today. 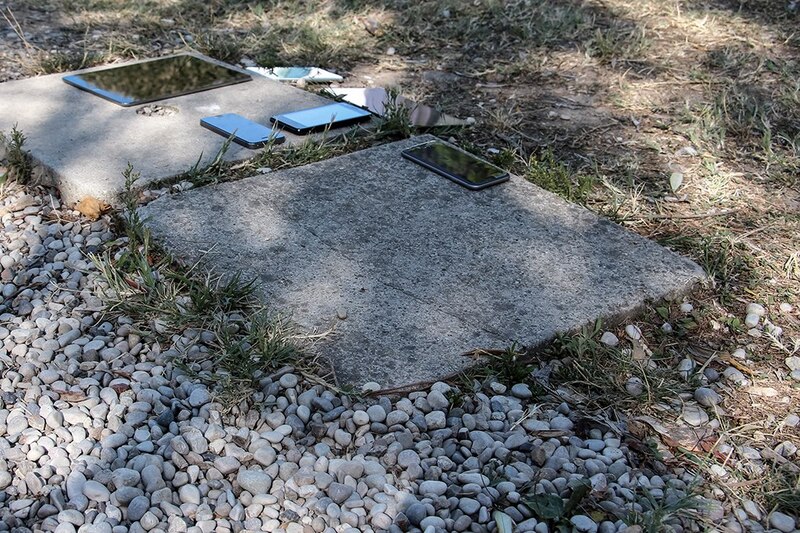 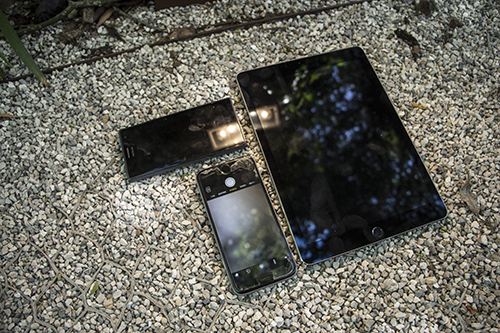 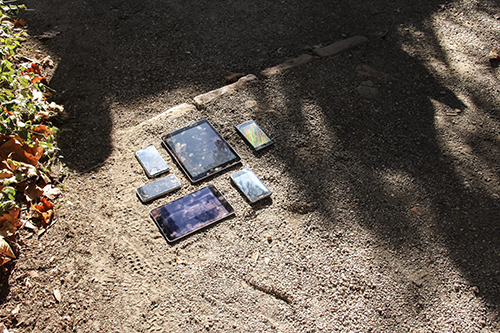 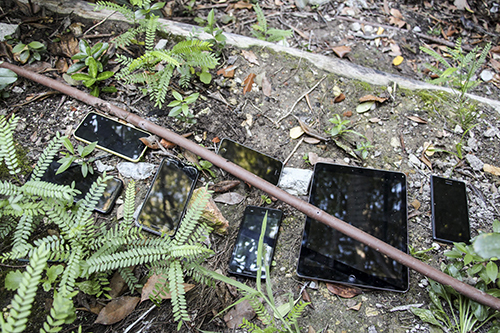 Each element began as a site-specific temporary intervention in the grounds of the Venice Biennale: Flato sourced (read: severed) mobile devices from willing Biennale goers and interjected them into the grounds of the Giardini to function as black mirrors, interrupting the negative space of the event (between, behind, and beneath the pavilions). 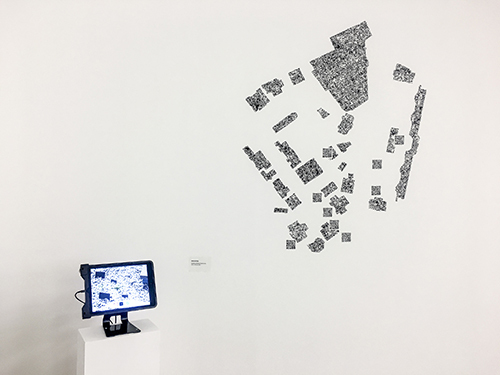 Each installation was subsequently digitally photographed, remediated as text, and disseminated on Instagram under the hashtag of #iDisplacement. 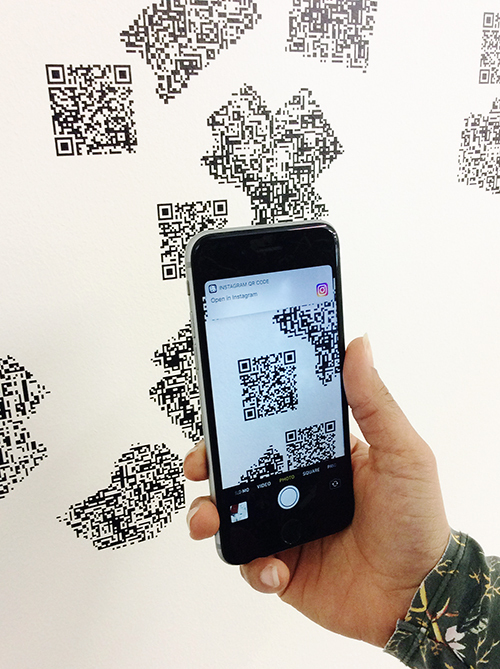 In a gallery setting, viewers access each individual element on their mobile devices by scanning the QR codes integrated, by corresponding location, into an abstracted map of the original site mounted in adhesive vinyl on the wall, like an alternative wall text composed of a labyrinth of impotent and responsive forms. 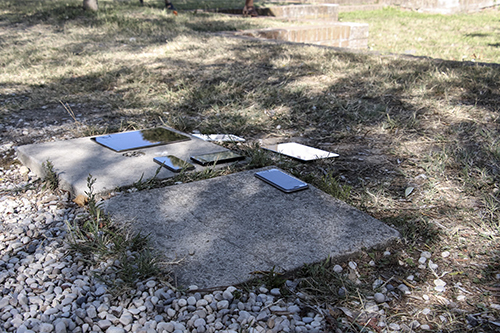 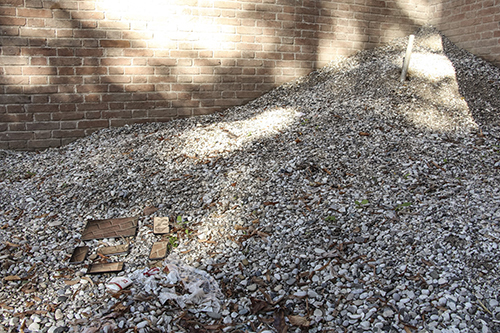 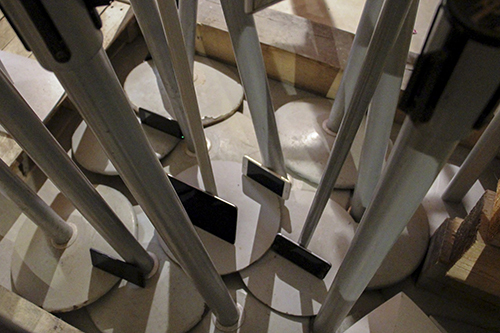 #iDisplacements is a reinterpretation of Robert Smithson’s 1969 “Mirror Displacements” project and its corresponding essay, “Incidents of Mirror Travel in the Yucatan,” published that year in Artforum. 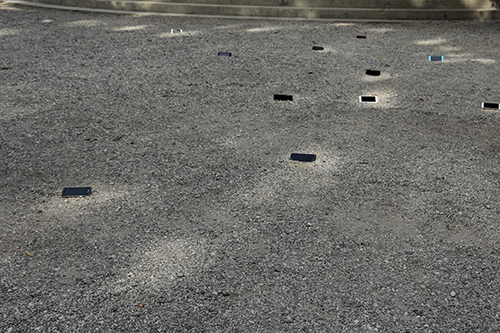 Almost fifty years later, the ink-black of the ever-ready pocket mirrors of today displace not the ‘jungles and wastelands’ of the Yucatan—a site Smithson sought out for its elusive ‘wilderness’—but instead the Venice Biennale, a site built to showcase international fine art as the epitome of ‘civilisation’. 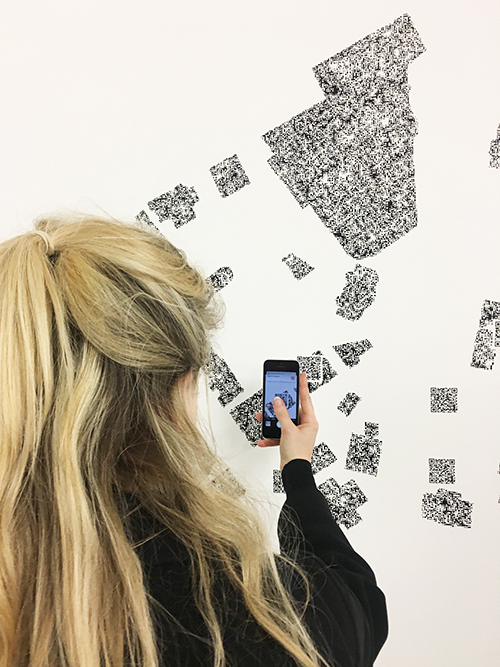 Meanwhile, the image-text documentations that follow are not statically contained in a print publication, but rather, are dynamically shared across social media. 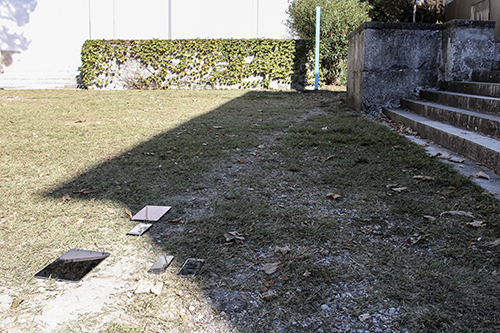 Each element is publically discoverable amidst all of the disparate global content shared under the thirty hashtags interspersed in the maximized captions of each post and under the various Biennale-related location tags, adding another understanding of contemporary ‘site,’ and another layer of ‘displacement,’ to the project.